“It was the 1995 Soldera [Brunello] that did it,” laughs Jan Hendrik Erbach, co-owner of Pian‘dell Orino in Montalcino with wife Caroline Pobitzer. A rustically attractive man with the charisma of a TV talk show host and the Einstein-like brain of crack geologist, Jan’s passion for terroir is easily conveyed to all who hear him speak. “As soon as I tasted that wine, I dedicated myself to finding the perfect terroir to create an even better Brunello di Montalcino.” Though that hunt absorbed tens of thousands of euros and years of intensive research, the happy results are easily apparent as one observes his neatly trimmed vineyards, comfortable looking farmhouse, and merrily barking dogs. If you have read recent headlines in the world’s international wine magazines, you might realize that though terroir is a key word in all wine regions, it takes on a heightened meaning in Montalcino. At 2,100 hectares, the region is a mosaic of various terroirs, altitudes, and microclimates, some better for growing sangiovese (the only legally allowed variety) than others. A producer can buy land, follow the appellation rules, and label his wine a Brunello, but would it be a good Brunello? Terroir is the deciding factor, and this is the reason that small producers like Jan, and larger, brand name producers like Angelo Gaja, have invested fortunes small and large in the search for terroir. Geologists have found so many different soil profiles in Montalcino that there is now talk of creating defined sub-appellations, each one to be based on a different soil. In the northwest, for example, one can find compact clay that yields tannic wines and demands carefully chosen rootstocks and hilltop vineyards. In Montalcino proper, the highest vineyards (400–600 meters [1,300-2,000 feet] above sea level) yield the longest-lived and most elegant Brunellos, with rich bouquets. Tavernelle and Camigliano, southwest of Montalcino, have warmer temperatures, 35-degree slopes, and conditions that promise even ripeness as well as structure. Jan and Caroline began their hunt in a rather philosophical way, based on Jan’s belief that the soil is crucial for the character of the wine. With the memory of that 1995 Soldera firmly in mind, he began to make a classification of the soils of Montalcino, striving to define the vineyards in a precise way. Eventually they found a farm (used for vegetables, not grapes) that had several plots with wildly different soil (clay, sand, calcareous Palombini among others) that would allow them to blend wines from different vineyards for increased complexity. 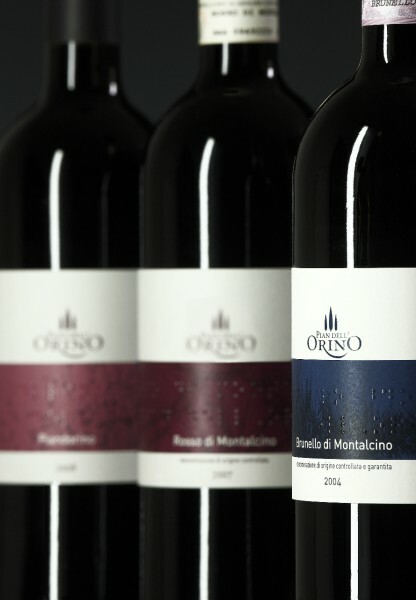 Today they make three wines, including Piandorino, which represents the style of the winery rather than the terroir, as it is taken from the clayey parts of all their vineyards. The idea of the Piandorino is to make a Sangiovese that is easy to understand and which helps them stabilize the quality of the other two. The Rosso di Montalcino vineyards are Pian’dell Orino (Calcarenite gradate, fine sandstones and silt, calcareous marlstone and marl) and some from Pian Bossolino (with deposits of arenite, layers of flysch of a fine and medium structure with inclusions of clay-silt layers of a different height and a south-southwest exposition). The Brunello vineyards are Pian Bossolino (clay and silt clay and marl, fine flaky, of changing dark grey to brown color, interspersed by grey calcareous layers and intercalations of quaternary sandstones), and Cancello Rosso (clay slate and foliated silt with intercalations of limestone, southern exposure). The wines are elegant and memorable with pure, focused cherry fruit. “Our interest in setting up a winery in Montalcino is to be a leader in the region; it is our new challenge for the future,” says Gaia Gaja of her father’s decision to seek out a property in 1994. Gaia is an energetic young woman with vibrant dark hair and incredible passion for her family’s vineyards. As was the case with Jan, the road to the Gaja family finding their dream Brunello terroir was long. Yet with a strong international brand behind them, the Gaja family could afford a team of researchers, consultants, and geologists to scope out the best eight properties and present the findings to Angelo Gaja. With his well-honed instincts, Angelo Gaja fell in love with the Pieve Santa Restituta, which had four vineyards and limestone and clay soils. There are three wines: a Brunello di Montalcino made from grapes sourced from all four vineyards; Renina, a Brunello made from the best grapes in three of the vineyards, and Sugarille, sourced from the vineyard of the same name which has a greater percentage of limestone. Pieve Santa Restituta does not produce a Rosso di Montalcino, as the winery prefers to focus on using the best grapes to create a showcase Brunello. Though Gaja is a big name, they can also be considered boutique in that they produce only a total of 6,000 cases a year from their three estates—and only in the best vintage—selling off vintages that do not meet their standards such as the 2002/2003 vintage in Montalcino because of bad weather. Running a winery is expensive, and given the investment in the winery and the vineyards combined with unfortunate vintages, it is doubtful the new venture has yet turned a profit. Yet Gaja is adamant the terroir of Pieve Santa Restituta is perfect for sangiovese, though it may be his children and grandchildren who reap the rewards. Or more appropriately, thanks to Jan Hendrik Erback and Angelo Gaja, it will be us, the Brunello consumers, who enjoy the labors of their search for the finest terroir. You recognize thus significantly relating to this subject, made me personally consider it from a lot of various angles. Its like men and women aren’t fascinated unless it’s something to accomplish with Girl gaga! Your own stuffs great. All the time maintain it up!